This combined degree equips students with a legal foundation for their creative practice or a creative foundation for a legal career. Students are immersed in the theory and practice of writing, exploring key genres and forms, including narrative writing, creative non-fiction, poetry and poetics, and screenwriting. The simultaneous study of a range of legal subjects, from the fundamentals of the law to specialist skills in niche legal disciplines, ensures that students meet the academic requirements for admission to practise law in NSW. Elective choices include cross-disciplinary studies in history, communication, media and country studies; specialist legal subjects, such as contracts, entertainment and intellectual property law; and the Legal Futures and Technology major, which provides first-hand experience of the technologies shaping the future of the legal profession. Graduates emerge with the high-level creative, analytical and communication skills required to manage the legal aspects of a writing career, or for a legal career in which creative writing skills can add eloquence and character to their work. Career options include media lawyer, intellectual property lawyer, solicitor, barrister, editor, publisher, scriptwriter, literary agent, communication coordinator, copywriter, novelist, feature writer, publications officer, freelance writer. HSC English and computer literacy. The course is offered on a five-year, full-time basis. Students are required to attend approximately 17 hours of seminars and lectures a week, and may be required to attend evening classes for the law component. The course comprises 240 credit points and allows students to graduate with the separate degrees of Bachelor of Communication (Creative Writing) and Bachelor of Laws. The study components for course completion are as follows. a 6-credit-point legal theory option. 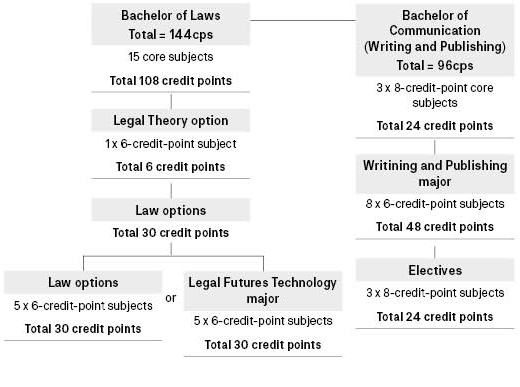 24 credit points of electives from cross-disciplinary subjects. For a current listing of subjects in each course refer to the study package directory. To practise as a lawyer in NSW, students need to successfully complete an accredited legal academic qualification (e.g. Bachelor of Laws) and an accredited course of practical legal training (PLT), which UTS offers through its PLT program. Students enrolled in this course may complete their practical legal training by undertaking a postgraduate course in PLT, such as the Graduate Certificate in Professional Legal Practice (C11232). The standard program shown is for a full-time student with law options. All options shown are law options and are to be drawn from those on offer in CBK90922. Students wishing to study the new major MAJ09443 Legal Futures and Technology need to study 76106 Technology Law, Policy and Ethics (Capstone 1) in the Autumn session of their final year and 76107 Applied Project in Law, Innovation and Technology (Capstone 2) in their final Spring session. Students can graduate with a Bachelor of Laws (Honours) if they complete subjects 76090 Research Methodology and 76040 Research Thesis within the course. The degree may be awarded with first or second class honours, which does not require an additional honours year. The rules concerning the Bachelor of Laws (Honours) can be found in undergraduate course information. Students who meet these criteria for honours are eligible for transfer into the appropriate undergraduate honours exit course on completion of all coursework. This transfer is managed by the Haymarket Student Centre and occurs just prior to graduation. Students who undertake the Legal Futures and Technology major and who meet the criteria for honours can choose to undertake honours as part of their degree. The Bachelor of Communication (Honours) (C09047) is offered on a one-year, full-time basis. This course satisfies the requirements for admission to the Supreme Court of NSW as a lawyer, provided students complete a practical legal training program, such as the Graduate Certificate in Professional Legal Practice (C11232).